For over 30 years, people across the world have used the Memory Joggers from GOAL/QPC to learn new tools and methodologies. This in turn has helped them to improve their skills and their work processes. The wealth of information contained in each Memory Jogger, the easy to use layout, and the signature spiral bound pocket size, make each Memory Jogger an ideal training accompaniment and on the job reference guide. Now, having sold millions of Memory Joggers across the world and gained a world-wide renown for them, GOAL/QPC is offering you the chance to demonstrate your knowledge and expertise to the world by becoming Memory Jogger Certified in the Memory Jogger titles of your choice. All you have to do is take the new Memory Jogger Certified exam. The exam is open book and you can take it online in your own time. The exam consists of 40-60 questions covering all of the topics in the specific Memory Jogger of your choice. 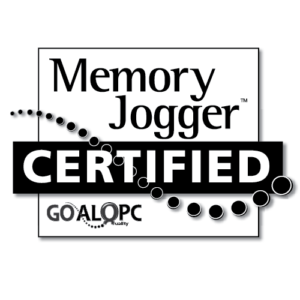 If you want to become Memory Jogger Certified in another Memory Jogger title, simply email service@goalqpc.com with your request and we’ll let you know when it becomes available. The Memory Joggers from GOAL/QPC have a world-wide standing in the fields of quality, business methods, and improvement. Having a Memory Jogger Certified on your resume will testify to your mastery of the tools and methodologies contained in the Memory Joggers and communicate your new earned status to peers, managers, recruiters, and professionals.